South Africa now has a new set of banknotes, with the Nelson Mandela notes going into circulation on Tuesday 6 November. The current and new banknotes will circulate together and both remain legal tender. 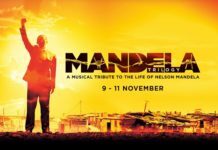 South Africa now has a new set of banknotes, with the Nelson Mandela notes going into circulation on Tuesday 6 November. People used to the colourful animal-themed banknotes will now see an image of the former president on the front, while the reverse will feature the Big Five animals as before. South African Reserve Bank governor Gill Marcus described the South African currency as a symbol of the nation, with people handling millions of banknotes every day. The Reserve Bank has been running a countrywide educational and awareness campaign in the months leading up to the launch, with advertisements in all media formats including social media, and a dedicated minisite. Citizens have had the chance to familiarise themselves with the security features of the new banknotes through events such as road shows and other outreach initiatives. The region’s common monetary areas of Swaziland, Namibia, Lesotho, Mozambique, Botswana and Zimbabwe were not left out. At the launch of the communication campaign in September, Mandela’s former wife Winnie Madikizela Mandela said she was proud of the new design and thankful to the staff of the Reserve Bank. The current and new banknotes will circulate together and both remain legal tender, said the Reserve Bank. South Africa’s notes are printed by the South African Banknote Company while all coins are manufactured by the South African Mint, both subsidiaries of the Reserve Bank. The Reserve Bank has advised people to get to know their new currency through the look, feel and tilt method. 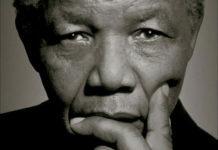 Holding the note to the light will reveal a watermark of Mandela on the upper left side, while a representation of the animal that appears on the reverse will be seen in an oval on the lower left. 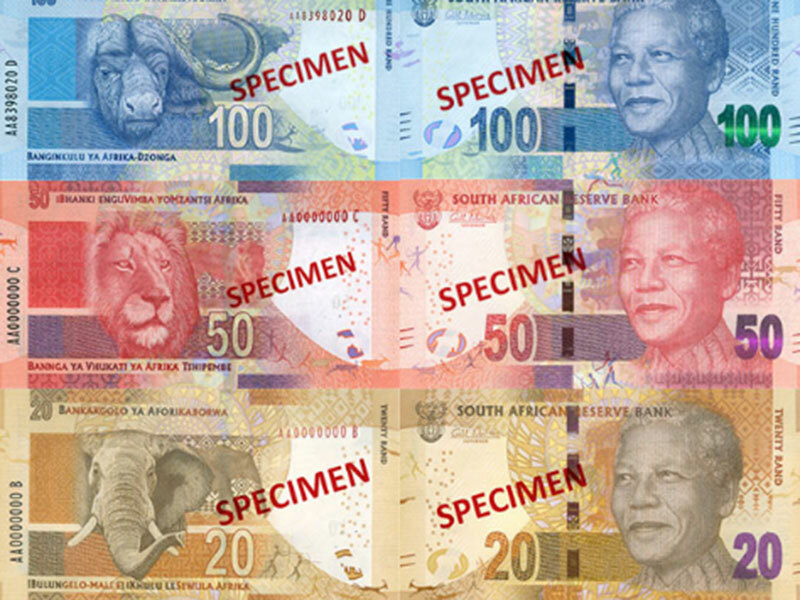 The note’s denomination is written in micro-lettering in the animals just to the left of the main Mandela image. This feature can also be seen on the reverse. Each note has a unique code comprising letters and numbers – these are printed vertically on the bottom left and horizontally on the upper right of the back. 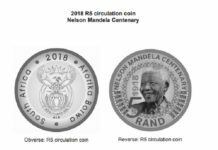 By feeling the note, several raised features can be discerned – they are the denomination numeral, the image of Mandela on the front, the words “South African Reserve Bank”, the coat of arms in the top left corner, and the motif on the back. In addition, there are raised lines on the bottom left and right that will help visually impaired people to identify the denomination. The R10 has one raised line and the R20, R50, R100 and R200 have two, three, four and five raised lines respectively. When the note is tilted, further features become apparent – the security thread colour will change to the colour of the respective banknote, and in the thread, the note’s number, the coat of arms and the words SARB and Rand will be seen. The back of the new notes still feature the Big Five animals and other cultural elements such as San art.The number on the bottom right of the R10 and R20 notes is printed in colour-changing ink, while the ink on the R50, R100 and R200 notes gives a rolling-bar effect. Finally, when the note is tilted almost to the horizontal, the denomination numeral appears in the band below the image of Mandela. The new notes are decorative as well as functional – each features elements of traditional San rock art, depicting the ancient figures hunting, fishing or engaged in other activities. The familiar Big Five animals are still present on the back – they are the rhino (R10); elephant (R20); lion (R50); buffalo (R100); and leopard (R200). In terms of size, the new notes are the same as the current banknotes. They are 70mm in height, with 6mm differences in length. The colours are also for the most part the same, except for the R200, which is an orange-yellow colour that distinguishes it from the R20 note.